Anyway, you will need a ton of pecans but you can use walnuts as well if they are more affordable. If you feel adventurous try a pistachios mix, that would be my next project actually. So chop them as big as you want, though I would recommend a bit smaller then I did in my picture, they composition will be more uniform. Next melt the butter and brush the bottom and sides of the baking dish with it. Place one sheet of phyllo at the bottom of the dish, then butter the top of the sheet. Place another sheet on top of it and brush the top again. Repeat this until you have about 6 pastry sheets. Sprinkle about a tsp of cinnamon over the pecans and mix them well. Spread ⅓ of the mix over the first set of phyllo sheets. 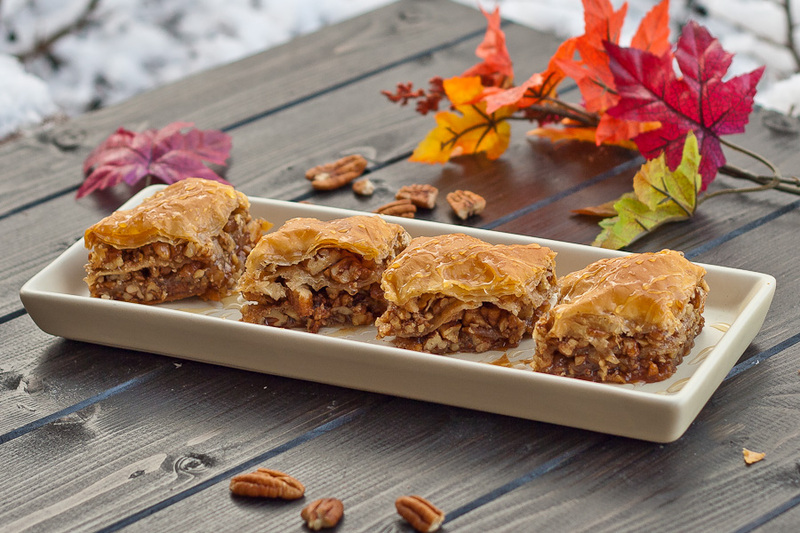 Brush a phyllo sheet with butter and lay it with the buttered side down over the pecans. Brush the top side with butter and lay another sheet over it and… you get the idea. Repeat until you have another 5 or 6 phyllo sheets. 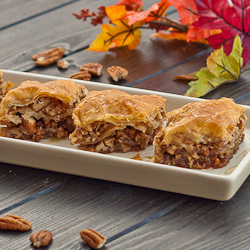 Basically you end up having 3 layers of pecans and 4 layers of phyllo dough but I guess that can be changed if you want. Butter the last sheet as well and using a sharp knife cut the baklava diagonally, or into squares, which ever way you prefer. Bake it in a preheated 350° F / 175° C oven for about 35 to 40 minutes. Now it is time to make the honey syrup. In a medium sauce pan, add the sugar, water, butter, vanilla extract and honey. Stir well and bring to a boil. After it starts boiling reduce heat to medium low and let it simmer until the baklava is ready, stirring occasionally. When your baklava is done pour your syrup all over it. Preheat your oven to 350° F / 175° C.
Melt one stick of butter and brush the bottom and the sides of the baking dish. Throw in one sheet of phyllo then butter the top of the sheet. Place another sheet on top of it and brush the top again. Repeat this until you have about 6 pastry sheets. Add a tsp of cinnamon to the chopped pecans and mix well. Sprinkle about ⅓ of the pecans mix over the first set of phyllo sheets. Bake it for about 35 to 40 minutes. In a medium sauce pan, add the sugar, water, the remaining butter, vanilla extract and honey. Stir well and bring to a boil. After it starts boiling reduce heat to medium low and let it simmer until the baklava is ready, stirring occasionally. Let it rest for few hours. Sorry! Actually the remaining butter was used for syrup but I mistyped the sentence, thanks for pointing that out. To answer your other question, 1 stick of butter is 113 grams. Great recipe! I made this just yesterday and am enjoying delicious baklava right now. I used orange juice in place of the water and added some orange zest to the pecan-cinnamon mixture, a nice twist if you like oranges. Thanks for the recipe, Happy baking! I think the amount of pecans could be cut down a bit. Up to you! I love pecans!